1. Debone the boiled fish pieces and take out the flesh . Don’t take the skin . While boiling , don’t put too much water . Water releases from the fish too . so don’t boil with excess water. 2. Pre-heat the oven to 350 FH and grease and line a loaf pan with parchment / wax paper . 3.In a food processor combine all the ingredients and blend until incorporated . 4. Put the fish into the pan , rub some oil over it and bake for 50 minutes . Now broil another 10/ 15 minutes or until you get the golden brown color on the top . Broil at 400 FH . 5. Now let it cool completely . Otherwise you may find difficulty in slicing . Slice and you can preserve it in fridge until you are ready for the final step . 1. Fry the onions till golden brown . Don’t make it too dark, other wise the korma will be dark colored . Keep it aside . 2. Rub the fish pieces with little turmeric and salt . 3. Beat the yogurt and sweet yogurt together until smooth . Heat oil and fry the fish a little while . Just for a minute or so . Keep it aside and let them cool . When cool , put them into the beaten yogurt . Carefully rub the yogurt over the pieces . 4. In another pan , heat ghee+ oil , now add the onion paste . Fry for a while . Now add the bereshta/ fried onion , ginger paste and garlic paste . Add little turmeric, chili powder, coriander powder and salt . Add little water and cook very well . That is called “koshano” in Bangla . Now add the fish pieces carefully . Add the beaten yogurt with little water . Turn the heat to low and close the lid . Cook on low flame and add the cracked green chilies 15 minutes later . Keep cooking on low flame until the oil separates , another 10 minutes . Enjoy with polau or white rice . 1. Marinate the fillet strips with lemon juice and crushed black or white pepper . Make a batter with 2 eggs and 4 tbl spoon of all purpose flour . Add salt and little nutmeg powder . Now add the fish strips and allow to rest for at least half n hour to infuse the flavor . 2. 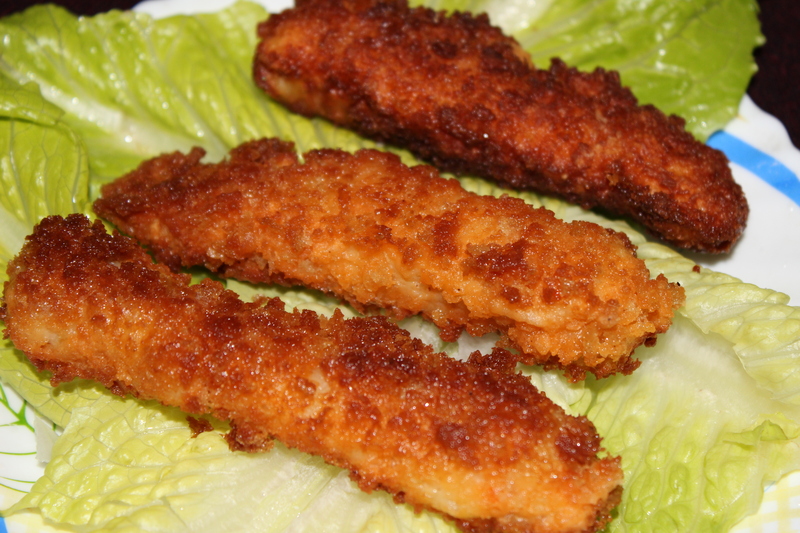 Coat with bread crumbs and fry in a frying pan with enough oil . It shoud not be deep fried but must be fried with enough oil ..
Dampukht is one of the characteristics of Awadhi ( Luknowi) cuisine , being it’s root in Persia . It is a technique or process of slow cooking in a sealed container or utensil . The food is cooked on very low flame , that we call to keep on “dam” . The lid should be airtight so that the steam is locked inside and the food is cooked in it’s own juice . Usually the lid is sealed with flour dough . But I didn’t seal the lid with the dough but used a very tight lid , so that the air should not enter into the utensil . 1. Marinate the fish with all the ingredients , except green chilies for at least an hour . 2. Now transfer the fish with whole marinade in a heated utensil . You may add little water , like 1/4 th cup of water at this point . Cover the lid tightly . Cook on low flame for about 1 and half hour or until reaches the desired consistency checking it occasionally not before first 45 minutes . 3. Add the green chilies just few minutes before you turn off the stove !! 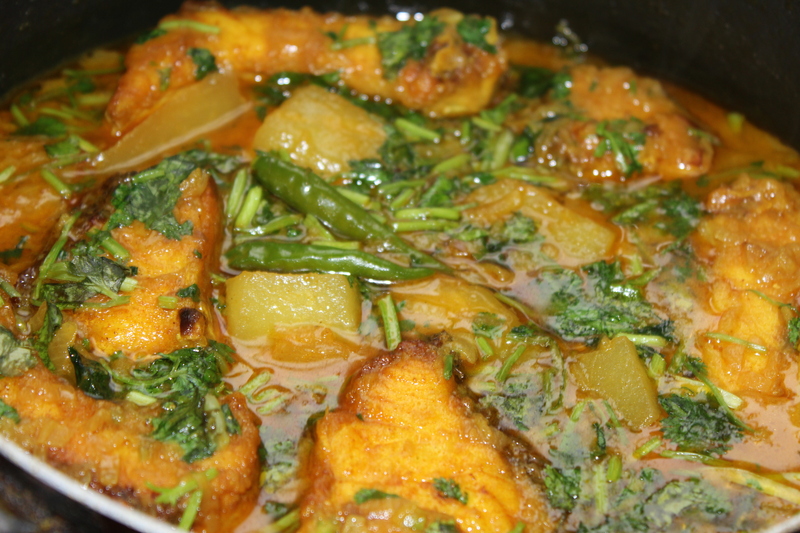 Serve hot with Polau , steamed rice or even Naan roti . 1. Please make the bereshta or fried onion at home . Don’t use the store bought one . If you do so , you may not get the full flavor . Nothing beats the home made bereshta . 2. Be careful while doing bereshta . Don’t burn it up . That may ruin the taste . The better is the color of bereshta , the better is the look of fish . Mix them all together very well . Your Tartar sauce is ready . 1.Marinate the fillets with Worcestershire sauce, mustard paste, crushed black pepper and salt . Now add one beaten egg and 2 tbl spoon of flour . Marinate the fish in this mixture for a while . 2. Take each piece of fillet and coat them with breadcrumbs . Fry them in enough oil at medium low heat . It should not be deep fried but you have to take enough oil to fry them . So take a frying pan and put enough oil in the pan to cover the nuggets . 3. Assemble the burgers by spreading some tartar sauce on the bun , followed by the lettuce , the fillet , some more tartar sauce , tomato and onion ring . Cover it with the other half of the bun . 1. Tartar sauce has a tangy flavor . So if you don’t like pickles and the tangy flavor like my daughter , then don’t add any pickles in the mayonnaise . 1. Cut one fillet of a fish and cut them into nugget shapes . You will get at least 7/ 8 nugget pieces from one fillet . 2. Marinate it with Worcestershire sauce, mustard paste, crushed black pepper and salt . Now add one beaten egg and 2 tbl spoon of flour . Marinate the fish in this mixture for a while . 3. Take each piece of nugget and coat them with breadcrumbs . Fry them in enough oil at medium low heat . It should not be deep fried but you have to take enough oil to fry them . So take a frying pan and put enough oil in the pan to cover the nuggets . Serve with tartar sauce or any dip of your choice !!! Today’s post is about a Singaporean fish item , vermicelli coated fried fish . Very crispy from outside and inside so tender . I really loved the combo!!! Singapore being a land of mixed races and culture , has so many fusion dishes . This vermicelli coated fried fish is one of my favorites among those . Very easy recipe yet so tasty . 1. Wash the fillets and pat dry very well with a kitchen towel or tissue . 3. Put the fillets into the batter and keep aside for at least half n hour . 4. Coat with vermicelli and fry both side very well on medium low heat . don’t deep fry .